PMS is the bane of many menstruating women's lives, but can a natural herbal tea really help with those pesky monthly mood swings? I've suffered from PMS (Premenstrual Syndrome) ever since I started my periods at the age of 11, and it's been one hell of a rollercoaster to ride into adulthood. My symptoms tend to vary in their extremities from month to month; I may manage to 'get away' with just a few 'mild' annoyances like breakouts, bloating, headaches and feeling more tired than usual, but then I have times when I experience full-blown PMS to the point where I find it incredibly difficult to get out of bed due to migraines, nausea and feeling depressed. I'm lucky enough to have a local female GP who understands periods and PMS, and for people who have the milder to moderate symptoms, a few tweaks in your daily life such as eating a more balanced and healthier diet, and doing more exercise, can make a big difference to managing the worst of PMS. However, one symptom that I've always struggled with has been mood swings, so I was interested to see what natural alternatives were out there to help with these. 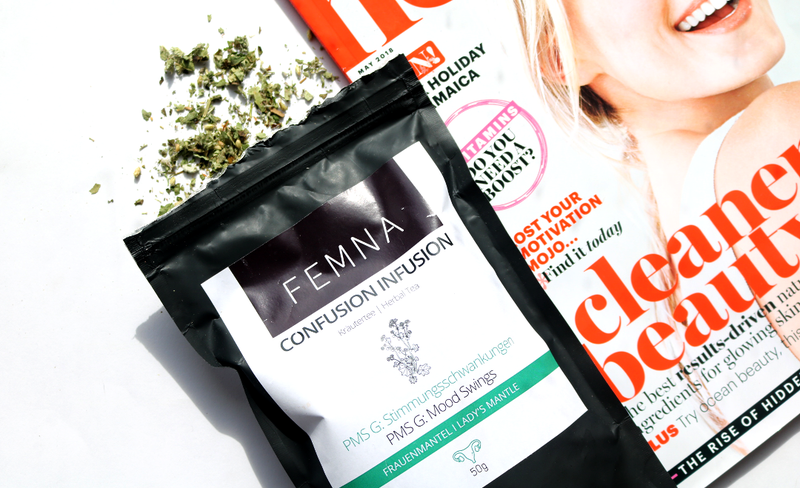 Whilst I was researching online, an email popped up in my inbox from an independent wellbeing brand called Femna, and it was like the universe was putting us in touch! Spooky, eh?! 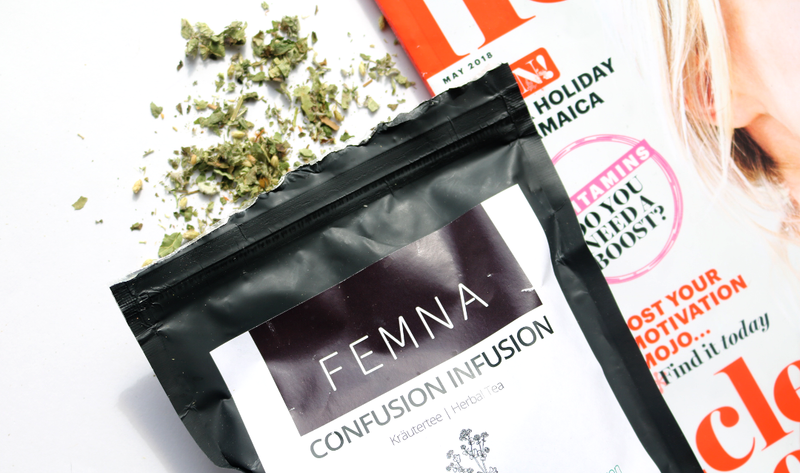 Femna are a small Berlin-based company who specialises in women's well-being, and they've developed a range of natural teas and products to help in the areas of PMS, menstruation, fertility, pregnancy and menopause. Founded by two young social entrepreneurs, Maxie and Emily, these two women are committed to helping other females in a more holistic and natural manner, rather than the traditional Western approach which sees women popping countless pills and not really fully understanding what's happening to their own bodies. When I browsed their products, a pop-up questionnaire appeared at the bottom of the left-hand side of their website, with some short statements about PMS and how you feel when you have it. Typically, I ended up ticking 'all of the above', and was re-directed to the Confusion Infusion Tea. I was curious to see if it would help with my mood swings, and Femna kindly sent me a sample to try. The Confusion Infusion Tea* is blend of beneficial anti-inflammatory herbs to help with general PMS and mood swings. It contains Lady's Mantle, Yarrow, St John's Wort, Lemon Balm, Silverweed and Peppermint to help calm the mind, soothe menses pain and brighten your overall mood. The tea is a loose-leaf one, so you just need to add two teaspoons to 200ml boiling water, infuse, strain and enjoy. You can drink 2-3 cups a day during the week before your period is due for the most noticeable results. It tastes similar to Green Tea strangely enough which I found pleasant and can be taken warm or cold, although I would recommend warm for the best soothing benefits. This tea did seem to help a little with my PMS mood swing symptoms. I didn't notice any huge changes, but I did feel a bit less snappy and my housemates kindly commented that I was 'less moody than usual' which is a firm positive! I'll certainly finish up the bag and consider repurchasing it in the future. Have you tried anything like this for PMS? P.S: Always visit your GP for professional advice if you're struggling with PMS, depression or anything else, and remember that you can request to see a different GP if you feel that the first one you see isn't listening or taking you seriously. Trust me, I've been there and it's always worth the effort to find the right GP to help you.